July 15, 2011 - Boeing has opened a new paint hangar near its Renton, Washington, facility that will help increase its Next-Generation 737 production capacity. The 737 program currently produces 31.5 airplanes per month and expects to go to 35 per month in early 2012, 38 per month in second quarter 2013 and then to 42 per month in the first half of 2014. 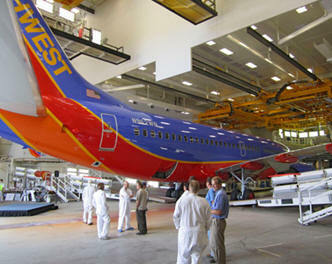 One of the first airplanes to be painted in the facility, a 737-700 for Southwest Airlines, was completed yesterday. Paint crews began work in the facility at the beginning of this month and now have incorporated the facility into the 737 production system. The state-of-the-art facility was refurbished in collaboration with the city of Renton. "The City of Renton is working very closely with Boeing to ensure its ramp up of production of the 737 is seamless," said Renton Mayor Denis Law. "Coupled with Boeing's signing of a 20-year lease agreement for the Renton Municipal Airport, we view the capital improvements such as those at the paint hangar as important signals that Renton will continue to be a center of commercial airplane manufacturing for many years to come. We will continue to do everything we can to ensure Boeing's continued success." "We identified this paint hangar as a key piece of infrastructure to support our future plans for increased 737 production several years ago," said Beverly Wyse, vice president and general manager, 737 program. "We have a measured approach to meeting rate increases on the program. Bringing this facility online demonstrates our progress." Boeing expects that the market for single-aisle aircraft will continue to grow over the next decade and beyond. With that outlook, the 737 program is taking several steps to ensure enough capacity to meet market demand. The paint hangar was originally built in the late 1950s at the start of the 707 program. The hangar also was used to paint 727s and 757s until 1994. The refurbished hangar is 165,000 cubic feet (4,672 cubic meters) by volume. The state-of-the-art environmental control and fire suppression systems meet all environmental and safety requirements. The hangar is equipped to paint all Next-Generation 737 models: -600, -700, -800 and -900. A crew of about eight painters can paint an entire 737 in about three days, depending on the detail of the customer's livery. The Boeing 737 is a short- to medium-range, twin-engine narrow-body jet airliner. Originally developed as a shorter, lower-cost twin-engine airliner derived from Boeing's 707 and 727, the 737 has developed into a family of nine passenger models with a capacity of 85 to 215 passengers. The 737 is Boeing's only narrow-body airliner in production, with the -600, -700, -800, and -900ER variants currently being built. Originally envisioned in 1964, the initial 737-100 first flew in 1967, and entered airline service in February 1968. It was followed by the lengthened 737-200, which entered service in April 1968. In the 1980s, Boeing launched the -300, -400, and -500 models, subsequently referred to as the Boeing 737 Classic series. The 737 Classics added capacity and incorporated CFM56 turbofan engines along with wing improvements. In the 1990s, Boeing introduced the 737 Next Generation with multiple changes including a redesigned wing, upgraded cockpit, and new interior. The 737 Next Generation comprises the four -600, -700, -800, and -900ER models, ranging from 102 ft (31.09 m) to 138 ft (42.06 m) in length. Boeing Business Jet versions of the 737 Next Generation are also produced. The 737 series is the best-selling jet airliner in the history of aviation. The 737 has been continuously manufactured by Boeing since 1967 with 6,638 aircraft delivered and 2,186 orders yet to be fulfilled as of December 2010. 737 assembly is centered at the Boeing Renton Factory in Renton, Washington. Many 737s serve markets previously filled by 707, 727, 757, DC-9, and MD-80/90 airliners, and the aircraft currently competes primarily with the Airbus A320 family. There are on average 1,250 737s airborne at any given time, with two departing or landing somewhere every five seconds.